The California Department of Public Health called it a “massive rodent infestation,” first exposed by the NBC Bay Area Investigative Unit. Nearly seven months later, the owner of Fremont-based San Francisco Herb and Natural Food Company says he has learned lessons, made changes and now wants to reopen his business as soon as the government gives approval. 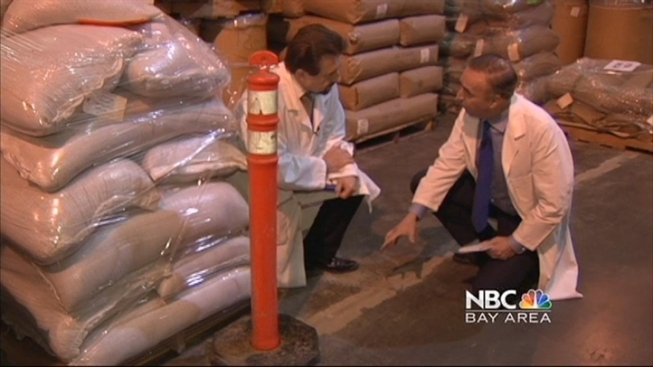 After learning of the NBC Bay Area investigation, the Food and Drug Administration and the state of California shut down the food product distributor in July, embargoed millions of pounds of tea, spice and herbs and announced a national food recall. For the first time since NBC Bay Area’s reports, owner Barry Meltzer sat down with Chief Investigative Reporter Tony Kovaleski to talk about what went wrong and how the company has cleaned up its act. Meltzer hired nationally-recognized food safety expert Allen Sayler to help guide the cleanup process. Sayler concluded that the major cause of the rodent infestation was dozens of small holes in the cracks between the warehouse’s concrete slabs that allowed mice to crawl through and infiltrate the facility. “Wherever there was a hole in the seam throughout the entire warehouse, (San Francisco Herb and Natural Food Company) cleaned it out and filled it,” Sayler said. The problem with cracks in the ground led to an infestation of mice, rodent droppings all over bags of product, and in one case, a dead rat that one employee said had burrowed into one bag of product. NBC Bay Area first aired the video and photos from inside the warehouse and heard compelling testimonials from two former employees who blew the whistle to the Investigative Unit. A second whistleblower also came forward in July to tell Kovaleski about a picture taken inside San Francisco Herb and Natural Food. Sayler said the fact that there was a problem at the facility was not up for debate. A detailed 18-page consent decree, issued by the US Attorney in San Francisco, requires the Fremont-based food product distributor to clean problem areas, eradicate the insects and rodents and sanitize the entire facility. According to FDA San Francisco District Director Barbara Cassens, the agency is still investigating. She says the company must present a reconditioning plan that meets federal standards before products can be sold and the facility is allowed to reopen. “We continue every week to have discussions with them so it’s really up to them to provide a reconditioning plan that we can live with, that we can certify, and then we will be on site to watch the reconditioning,” Cassens said. The federal embargo has kept San Francisco Herb and Natural Food Company from selling any product for nearly seven months. After major changes, Sayler says there has been no sign of rodent activity since August. A final determination on if and when San Francisco Herb and Natural Food Company returns to selling its products will be made by the State of California and the federal Food and Drug Administration.